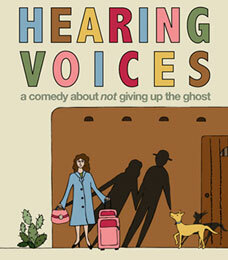 HEARING VOICES is a short-form narrative comedy series for distribution via TV, Internet, and DVD. Similar in tone to Seinfeld, Curb Your Enthusiasm, The Comeback, and The Office, HEARING VOICES is a witty, smart, 30 minute comedy—shot single camera style in multiple locations around the Albuquerque metro area. The story revolves around Jessi Nolan, a recently-widowed, 30-something voiceover actress who flees Los Angeles for a fresh start in Albuquerque. With her deceased husband’s dog Max as her only companion, Jessi starts off her new life in the Duke City. But in an ironic nod to sitcoms of the sixties, Jessi makes the supernatural acquaintance of Gabriel Mountbatten, a classic stage actor of the 1920s. Not sure if Gabriel is a ghost or a figment of her imagination, Jessi nonetheless embarks on a tumultuous relationship with him as she tries to figure out her life and career. The 1950s and 60s were an odd time for TV; there was a spate of popular “supernatural” sitcoms, including I Dream of Jeannie, The Ghost & Mrs. Muir, Bewitched, The Flying Nun, and My Favorite Martian. While sometimes a bit hokey, there was something intriguing about the idea of the supernatural world impinging upon suburbia. Fast forward 40 years or so. Many proclaimed the sitcom dead in back in 2007. With the exception of Seinfeld (which ended its run in 1998), there really hasn’t been an iconic sitcom that deeply connected with its audience. The supernatural sitcoms of the 50s and 60s successfully built their humor around an extraordinarily-contrived premise, while Seinfeld found big laughs in the minutia of pop culture and everyday life. It prompted a question in our minds. How would someone in our present day media-saturated, always online, Prozac-fueled world react if a ghost came to live with them? Jessi Nolan, the protagonist of HEARING VOICES, is a modern woman struggling with very real issues: the death of a spouse, the challenge of starting over later in life, loneliness, and career transitions. These major struggles are set against a backdrop of everyday annoyances, like getting into a tiff with the supermarket checkout clerk about bagging her own groceries (Jessi has control issues)—or becoming fed up with those omnipresent little stickers on fruit—or even the horror of finding a used Band-Aid inside your newly purchased pair of shoes. In her fragile emotional state, it’s not surprising that Jessi “hears voices.” What is surprising is how she deals with it on an every day basis. At its heart, HEARING VOICES is about coping. We all face adversity in our lives and so we can all relate to Jessi’s issues—even if our own problems aren’t complicated by a phantasmal house guest.